all of the 4th generation bonding systems. Combining proven self etching technologies with a new primer / bonding resin approach, SURPASS™ offers the highest shear strengths while eliminating sensitivity in one simple technique. 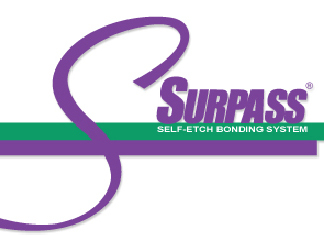 SURPASS™ is a three bottle system that combines a separate conditioner, primer and bonding resin. The conditioner etches enamel as well as phosphoric acid while eliminating post operative sensitivity The primer completely wets and penetrates the tooth structure to maximize bond strengths and completely seal the surface The bonding resin links the primed surface to all self cure, dual cure or light cure restorative materials Surpass has only one technique for all procedures There are no catalysts needed for any procedures Independently each SURPASS™ bottle optimizes an attribute critical to clinical success. When used as a system, SURPASS is the new Gold Standard in dental adhesion.